Title: 12/22/1992 - Requirements of hazard communication standard for listing chemicals. This is in response to your inquiry of October 7, concerning the Occupational Safety and Health Administration's (OSHA) Hazard Communication Standard (HCS), 29 CFR 1910.1200. You requested assistance in preparing an inventory of the chemicals in your office and the hazard class for each of the chemicals in a compound. First, we will clarify your responsibility in making an inventory of chemicals in the work place: employers must list the names of all hazardous chemicals used in the workplace by using the identity that is referenced on the material safety data sheet (MSDS). This identity is often a common name, such as the product or trade name (i.e. Lime-A-Way). 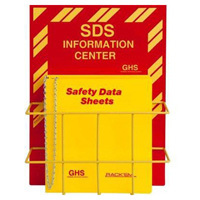 The rule does not require that you indicate the hazards of each chemical on the list; employees are informed of hazards through MSDSs and labels. Since this may be a point of confusion for you, we will briefly explain the HCS's hazard determination requirements. Chemical manufacturers must either determine the hazards of the product as a whole or assume that the mixture presents the same health hazards as its components. In cases where a chemical mixture or compound has not been tested as a whole, the manufacturer's MSDS must list all of chemical components that have been determined to be hazardous which comprise one percent or greater of the mixture, or 0.1 percent or greater for components that are considered carcinogenic. In either case, where the hazard has been determined for the mixture or the individual components of the mixture, all of the information should be provided for the employer and employees in the MSDS. We hope this information is helpful. If you have any further questions please feel free to contact us at (202) 219-8036. Attached please find a list of all the chemicals found in compounds typically used in a dental office and often found in my dental office. All of the potentially hazardous or dangerous compounds now have MSDS's supplied with them as required by rule. Often times the hazardous class information supplied by the MSDS relates to the compound as a whole unit rather than the individual chemicals in the compound. In order to have an accurate listing of chemicals and their hazard class I need a reference to look up each of the chemicals in a compound. I currently have a basic Hazardous Class Listing of the more common chemicals but many of the newer dental products have a complex mixing of chemicals some of which I can not find specific hazard classification on the supplied MSDS. I would appreciate any help you can give me in this matter.